We’ve been transferring our pinned insect specimens into new unit trays for several weeks now, an activity best described as time-consuming. When finished, we’ll have replaced our current mix of old, hard-bottomed and various types of soft-bottomed unit trays in VTEC with new, archival unit trays. 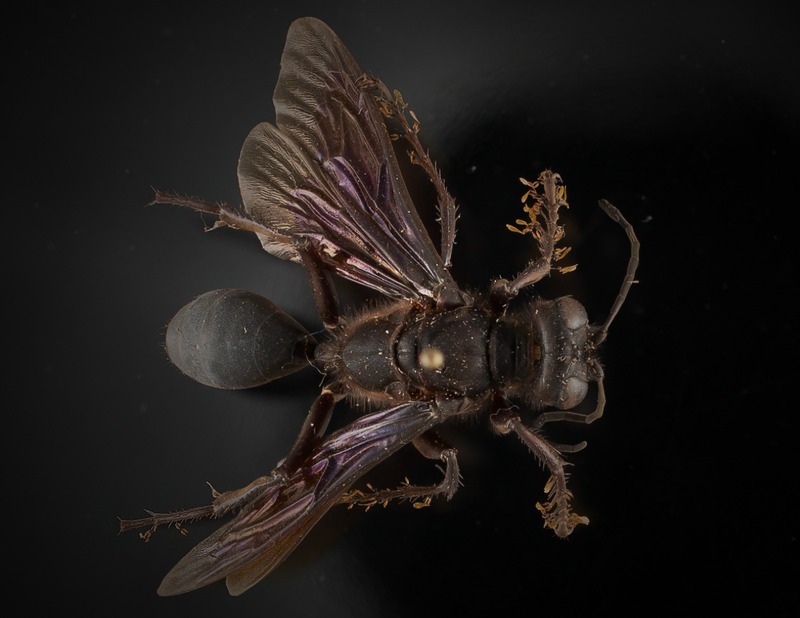 But one benefit to spending a lot of time looking at the specimens closely is that I see things that I might not have noticed with only a cursory glance in an insect drawer. For instance, I’ve found a number of specimens that I believe were collected by my thesis advisor when he was a student here at Virginia Tech in the 1960s. 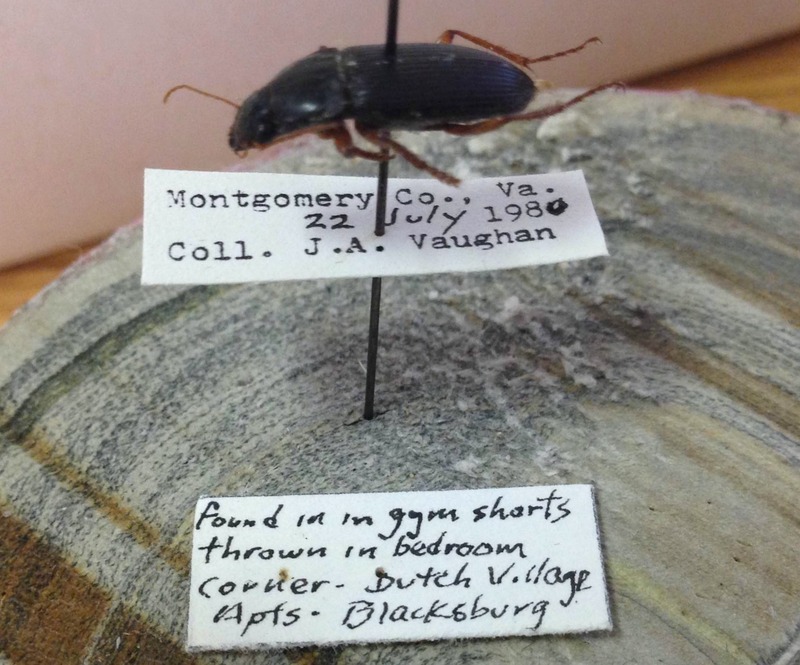 There isn’t anything particularly noteworthy about the material he deposited into the collection, but there’s a sense of history when you personally know the researcher who collected a particular insect 50 years ago. I also found a hackberry emperor butterfly (Asterocampa celtis) with a collection label that claimed the butterfly had “attacked the collector.” Hackberry butterflies are attracted to human sweat and are sometimes very enthusiastic about doing so. Unfortunately the specimen was so badly damaged by dermestid beetles that it was beyond saving. Notice the lighter-brown “sea-weedy” material on the tarsi? There’s a lot of it on the front legs (click on the photo for a larger image). We think these may be the thalli of a parasitic ascomycete fungus, possibly in the Order Laboulbeniales or a similar group. While some Laboulbeniales are associated with ants, I haven’t been able to find any published reports of these fungi on other Hymenoptera. These structures could be from a different type of ectoparasitic fungi or something else entirely, perhaps something new to science. Natural history collections are full of unrecognized species and hidden data waiting for someone to spot them, as described in this recent article from The Atlantic. I have no doubt that VTEC holds its share of hidden discoveries waiting for someone to bring them to light. Sadly, I don’t have the time right now to investigate this specimen any further as our new insect cabinets have just arrived! Our immediate goal now is to arrange the collection into an updated phylogenetic order in the new cabinets. Sometimes curation is more about housekeeping than scientific research. This entry was posted in Uncategorized and tagged butterfly, collection, curation, Laboulbeniales. Bookmark the permalink.